Longest name in the world aside, this might just be one of the most adorable soaps I've ever seen. 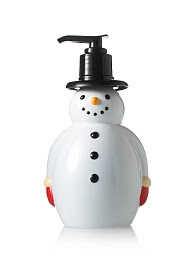 Bath & Body Works Holiday Traditions Deep Cleansing Soap with Snowman Bottle is just so perfect for the holiday season, it might as well just walk its way into my bathroom and stay there. Seriously, how cute is this little snowman? His top hat doubles as the soap dispenser, while his round body is accented with little black buttons and contains soap in the sweet Vanilla Bean Noel scent. (More about that in a moment.) He even gets to wear adorable red mittens! He just looks so happy to be giving out pump after pump of soap, it would be a shame not to let him do his job during the holiday season. The soap itself is a delectable scent of vanilla, formulated with caramel and cream to make it heady, deep and deliciously rich. And it makes skin unbelievably soft, what with its infusion of Vitamins B and E to moisturize and nourish. Better still, it contains cleansing beads that not only smooth rough patches but just feel, well, cool. And the best part? He doesn't melt. Available for $10 at bathandbodyworks.com.